Who doesn’t have a bottle of Tabasco sauce in their cupboard? We certainly do in fact we have several. And even if you don’t have a bottle in your own cupboard, you see that little red bottle squeezed between the salt and pepper in many restaurants. 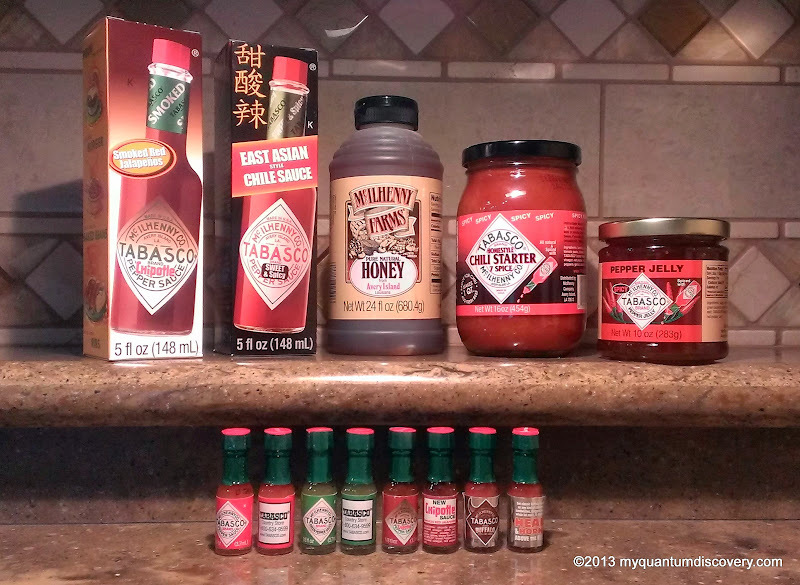 Who doesn’t love the hot and tangy flavor of Tabasco? But do you have any idea how it is made? 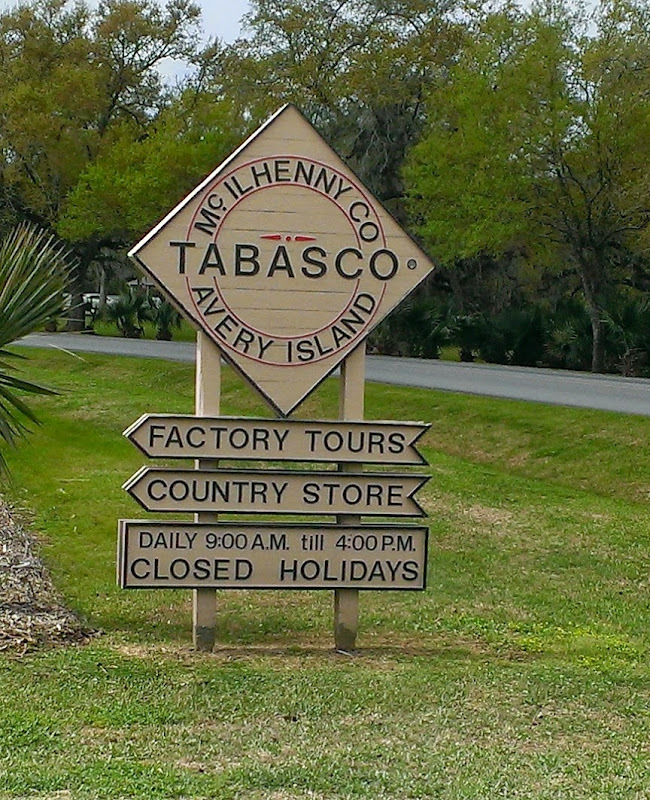 We didn’t so when some people we met during our stay at Hollywood Casino raved about the Tabasco factory tour, we really wanted to go there. 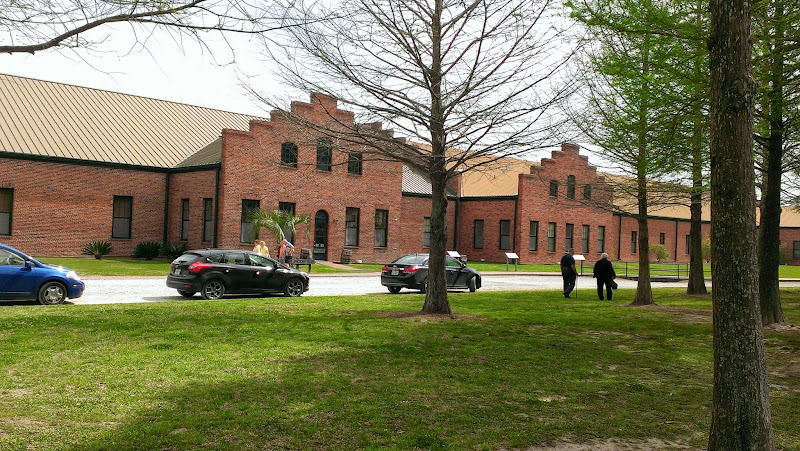 Although the factory was open seven days a week, we had read that you could only see the bottling process on Monday through Thursday so we decided we better drive to the factory on Avery Island about 20 minutes away on Thursday, April 3rd.The tour is free but you do need to pay a $1 fee to drive on to the Island. The island was originally named Île Petite Anse but was renamed for the Avery family who settled there in the 1830’s. At 163 feet above mean sea level, Avery Island is the largest of the five salt domes, measuring 5 miles long and 2 1/2 miles wide and extending some eight miles deep, found in this area. The American Indians would boil the briny spring water to extract the salt and then would sell it to other tribes in Texas, Arkansas and Ohio. In 1862 during the Civil War, a salt mine was founded which produced over 22 million tons of salt for the Confederacy until Union troops invaded the area, smashing buildings, steam engines and mining equipment and scattered tons of salt awaiting shipment. 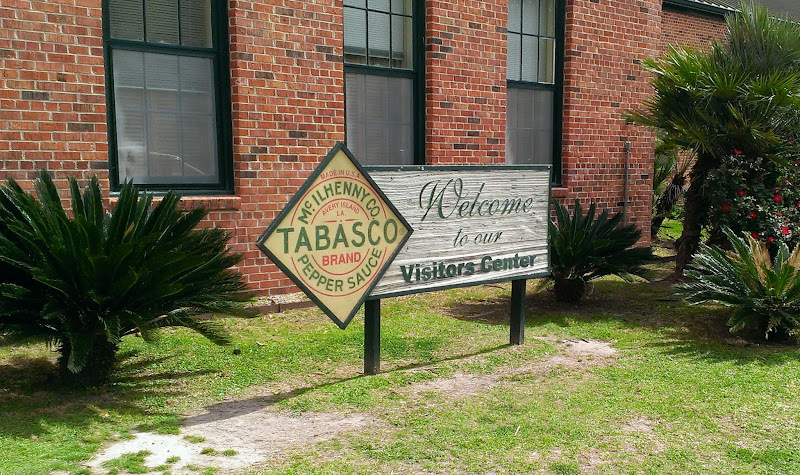 Edmond McIlhenny, the creator of Tabasco sauce, married Mary Aliza Avery prior to the Civil War. Shortly after that in the mid to late 1860’s, Edmond, an avid gardener and food lover, was given seeds of Capsicum frutescens peppers from Mexico or Central America. Loving the spicy flavor of the peppers , he decided to create a pepper sauce to add excitement to the foods he loved. Crushing the red peppers and mixing them with Avery Island salt, he created a mash which he then aged in crocks and barrels for 30 days. After the 30 days, he then mixed in some French white wine vinegar and aged the mixture for another 30 days. At the end of the aging process, he strained the mixture into small bottles which he then corked and sealed with wax. 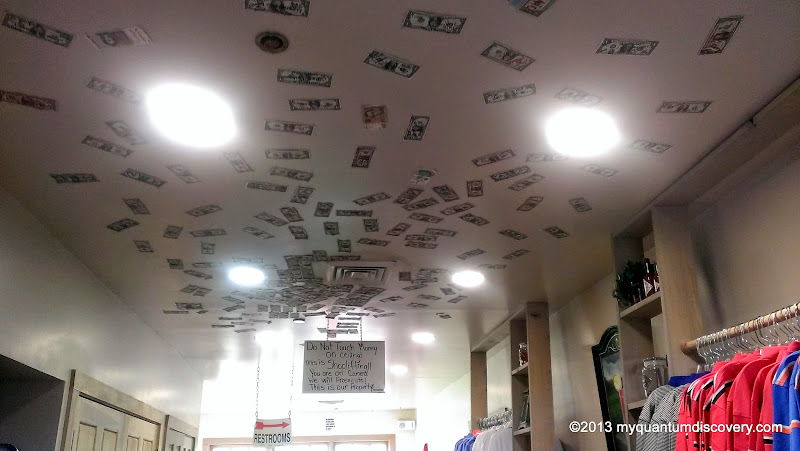 It became so popular with family and friends that he decided to leave his banking job and market his new product. 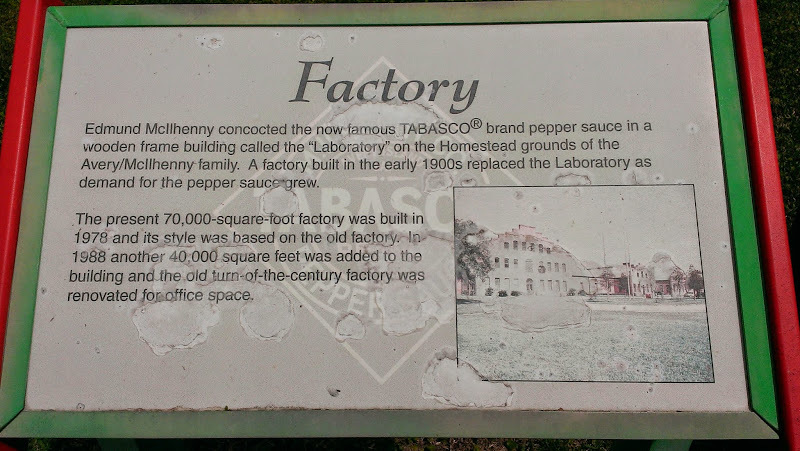 He grew his first commercial pepper crop in 1868 and within a year he had sold 658 bottles of his sauce which he labeled as “Tabasco,” a word of Mexican Indian origin believed to mean “place where the soil is humid” or “place of the coral or oyster shell. When Edmond died in 1890, he was succeeded by his eldest son, John Avery McIlhenny, who expanded and modernized the business. But after a few years, he resigned to join the Rough Riders. On John’s departure, brother Edward (“Ned) Avery McIlhenny, a self-taught naturalist fresh from an Arctic adventure, assumed control of the company and also focused on expansion and modernization, running the business from 1898 until his death in 1949. 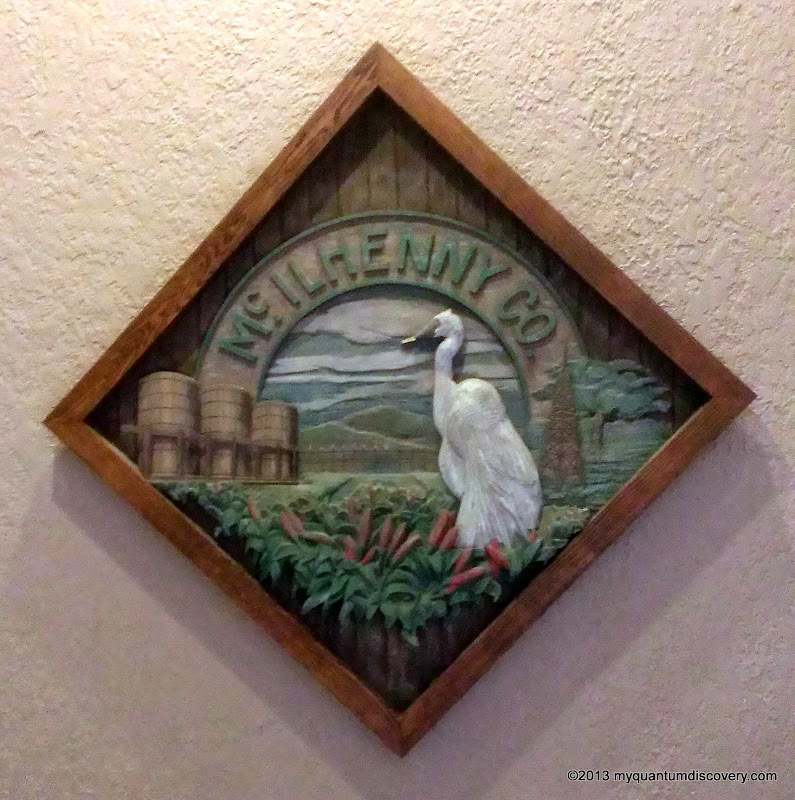 Several more of the McIlhenny family (Walter, Ned and Paul) assumed leadership of the company. In 2012, McIlhenny cousin, Tony Simmons, became the company’s president and runs the company today. When we arrived at the factory, there were 3 tour buses in the parking lot and a line hanging out the door to the visitor center. Oh, oh, did we pick the wrong day to do this? Turns out that they run the video every 1/2 hour so the line was because a busload of people were waiting to see the video. Finally we made it inside where a woman gave a talk about the history of the factory and how it is made today. She was pretty funny! 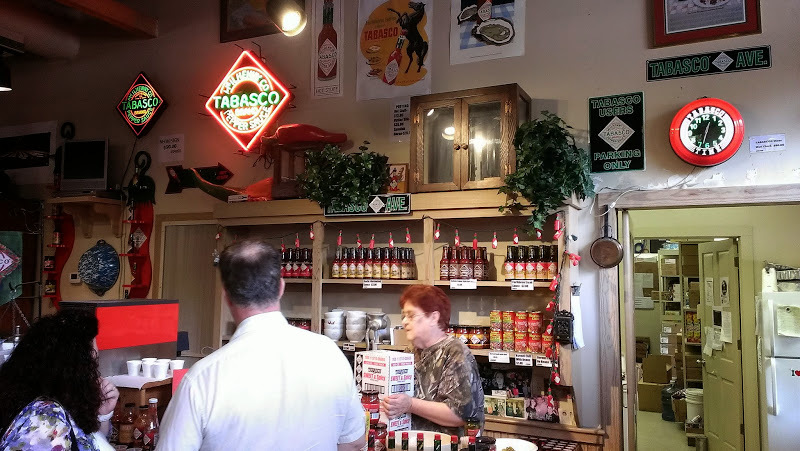 She started out by explaining that the company is still a family run business with 200 employees, many of whom are 5th generation descendants of Edmond McIlhenny. 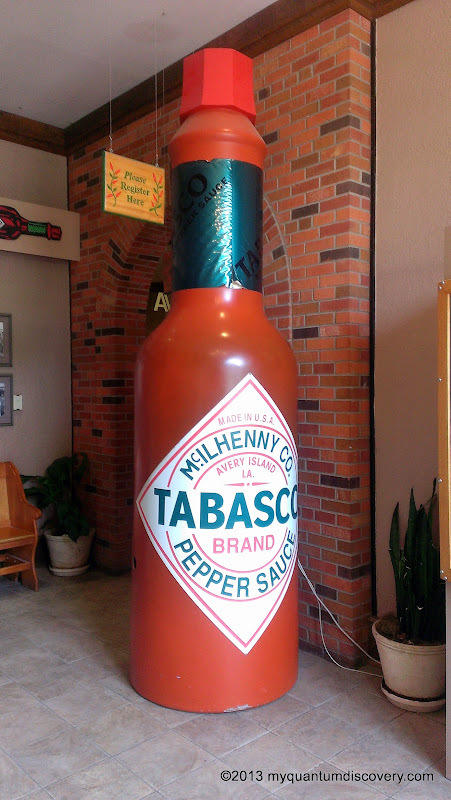 Over 700,000 bottles of Tabasco sauce are produced daily (wow, that’s a lot of sauce) which are labelled in 22 languages and sold in over 165 countries. The process is pretty much the same as the original one 140 years ago with only a few minor variations. After all, why change something that is so good! Because they ran out of room, the peppers used to make the sauce are no longer grown on the island, only seed peppers are grown there. The advantage of having the peppers grown in multiple locations is that some supply is guaranteed despite the threat of hurricanes, disease or insects. Once the seed plants mature, a McIlhenny family member inspects each plant and designates the best ones by placing a string on the top of the plant. Those seeds from the select plants are collected, treated and dried for use the following year and are stored both on the island and in a local bank vault to hedge against any disaster that might befall future crops. The seeds are then shipped to foreign growers in Central America where the peppers are grown. As the peppers age, they turn from green to yellow to orange and finally to red. Once ripened, following company tradition the peppers are hand picked and to ensure ripeness, they are compared by each picker to a small red stick “le petit bâton rouge”. Once harvested, the peppers are immediately shipped back to Avery Island. Once the peppers are received back on Avery Island, they are mashed and combined with a small amount of locally mined salt and placed in white oak barrels previously used at the Jack Daniels distillery (the barrels can only be used once at the distillery). These barrels are de-charred so the top layer of the interior wood is removed, torched and cleaned to remove the presence of any whiskey. Once the mash is placed in the barrels, it is covered with a thick layer of salt which helps to protect the contents and allows for the gases to escape during the fermentation and aging process – it does not affect the taste of the sauce. Instead of aging the mash for 30 days as in the original process, the mash is now aged for 3 years. After aging, the mash is inspected by a McIlhenny family member and if it meets approval, it is blended with a high quality distilled white vinegar. Once again it is aged for 30 days with frequent stirrings. After the 30 days, it is strained to remove the pulp, seeds and skins using three different sized screens. The finished sauce is then bottled. 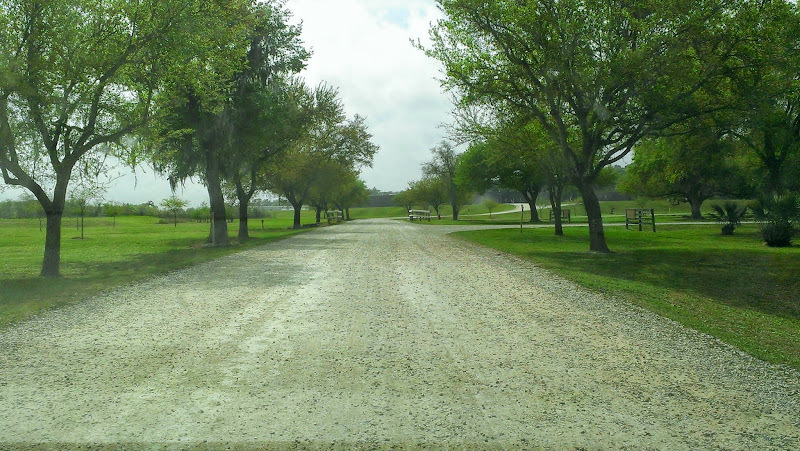 Nothing goes to waste here – the caked salt from the lids of the barrels is fed to the local deer population. 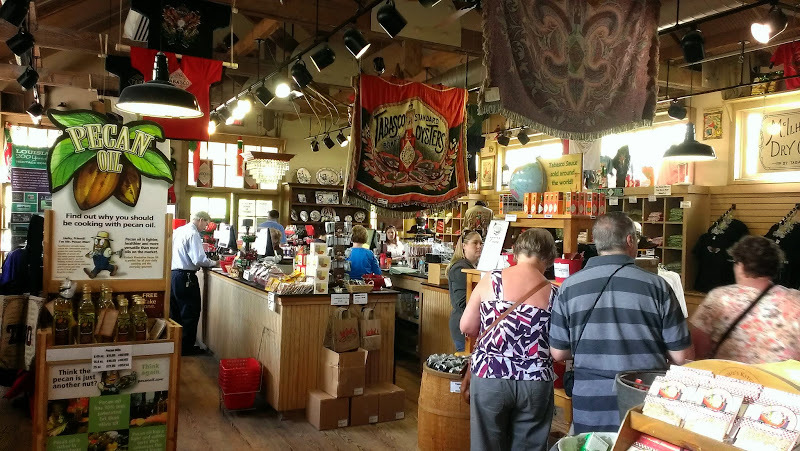 The woman giving the tour quipped “…our local venison is pre-seasoned!” The seeds strained from the mash are sold to a variety of companies who extract the capsaicin which is used to make Ben Gay, pepper spray, and several other common household products. 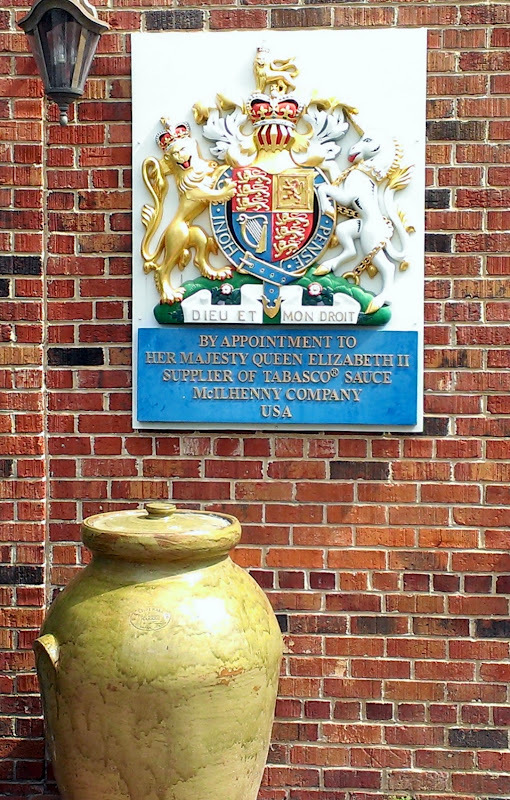 Interesting to note that in 2009, McIlhenny became one of just a few U.S. companies to receive a royal warrant of appointment that certifies the company as a supplier to Queen Elizabeth II. McIlhenny is one of the 850 companies around the world that have been officially designated as suppliers to the queen by such warrants. After learning all this, we were led to a room where we watched an excellent video about the history and the process of making the sauce, much of it reiterating what she had already told us. As we entered the room, she gave each one of us 4 little sample bottles of sauce (see picture at the end of this post). Once the film was over, we walked along a glass window where we could see the bottles being filled, labeled and boxed. 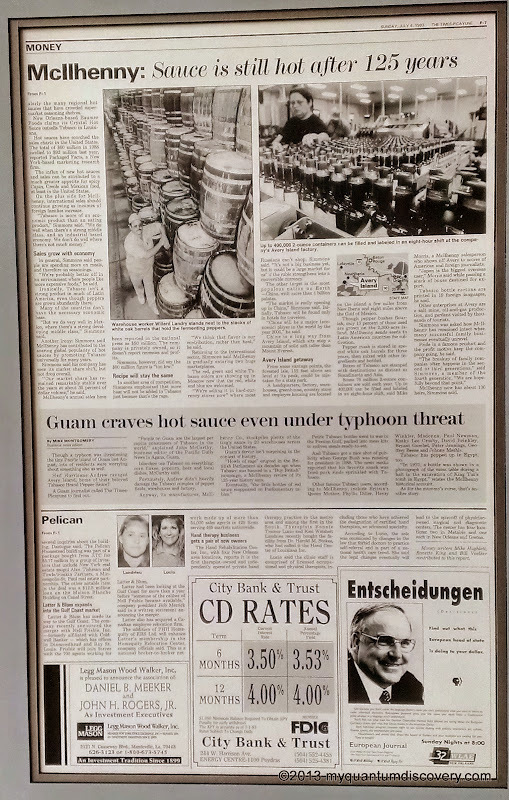 On this particular day, they were filling the bottles with habanero sauce which were going to be shipped to Germany. Fascinating watching the bottling operation! At the end of the bottling section, we walked into a small museum where they had quite a few displays. Sample barrels topped with salt, a big vat full of mash, a “Feel the Heat” display that allowed you to see the heat levels based on the Scoville scale of the various sauces. Want to know which sauce is the hottest? At 7,000 Scoville heat units, habanero is the hottest followed by the original recipe which is 2,500 to 5,000 Scoville heat units. 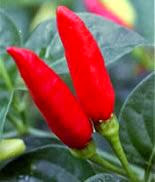 The least spicy is their Sweet and Spicy at 100 to 600 Scoville heat units. After that we went outside and walked over to the company store. Here you could sample many of their products by taking a pretzel stick and dipping it into any of the bowls of sauce, jelly or salsa. Chipotle, jalapeno, buffalo, garlic pepper, sweet & sour, green pepper, and habanero – who knew they had so many sauces! In addition, they had small cups of chili made with their chili starter. 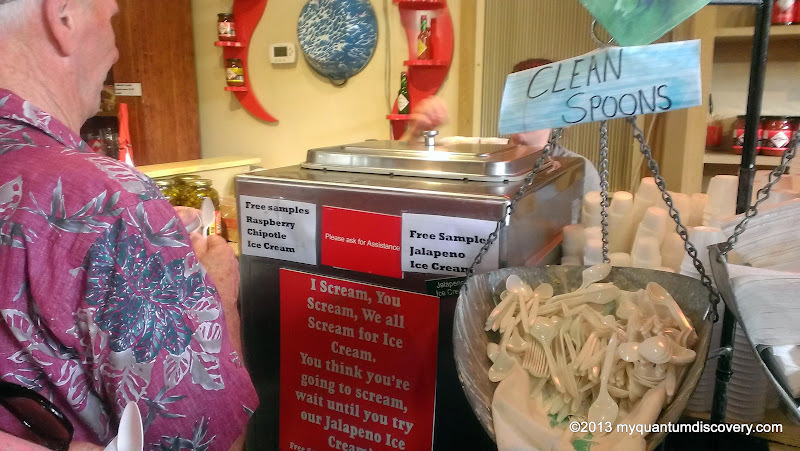 If you are not interested in the sauces, chili or jellies, perhaps you would rather to try some jalapeno ice cream? Or perhaps some raspberry chipotle ice cream? Both flavors were quite different with a very distinct sweet yet with a bit of a kick. Hard to describe! And then there was Tabasco flavored soda. What won’t they put Tabasco into! 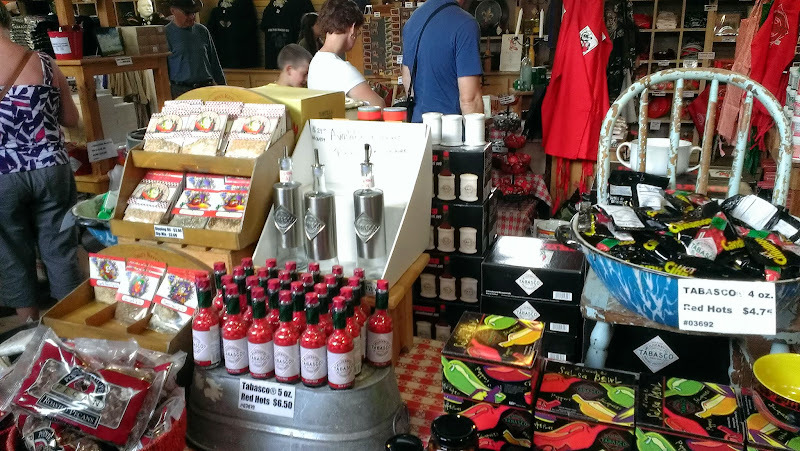 Then of course, there are all the products that we didn’t get to sample – bloody mary mix, condiments such as Tabasco brand ketchup, mayonnaise, salt, steak sauce, and barbecue sauce. 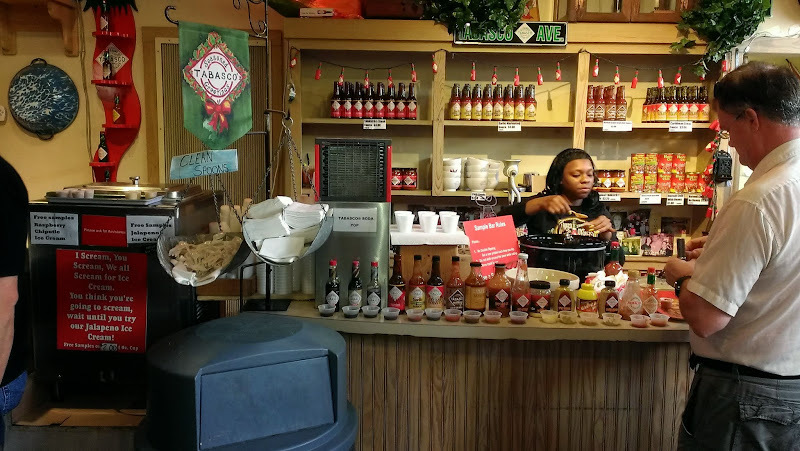 Of course we didn’t walk out of there without buying a few items – bottles of their new sweet and spicy sauce, chipotle sauce, chili starter sauce (which is excellent), honey (not Tabasco flavored) and a jar of pepper jelly. 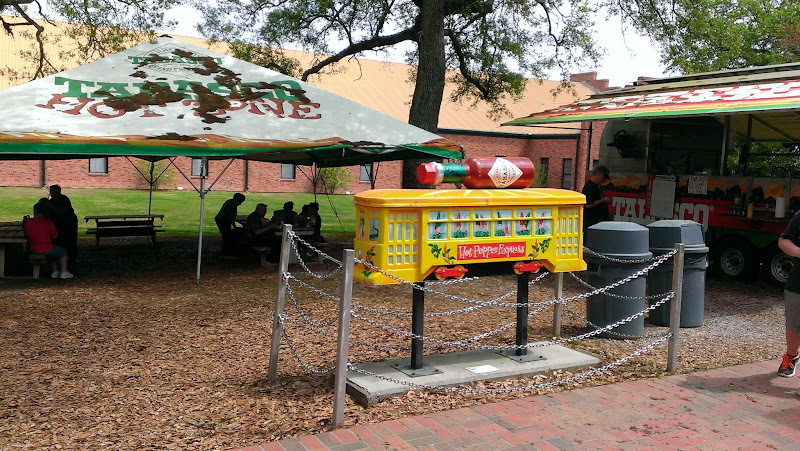 Next to the store they had a lunch stand where they sell local foods such as jambalaya, rice and beans, gumbo and other items. We decided we would have lunch elsewhere after we did some more sightseeing on the island. More about that in our next post!